Palm Reading just released version 2! Its Remade completely. Version 2 is out! Remade completely! Palm Reading Premium is the most luxury and professional palmistry and chirology software out there developed by crazysoft. You can use it to analyze, read and master your palm lines and palm fingers without knowing anything of hand reading / palm reading. Understand yourself better with simple / quick and entertaining image tests. Get analytics of your own palm or your friend's palm and reveal all its secrets and future. This is no nonsense, it works. Test your left hand and you will see what you are. The right hand will show you how you want to be seen by others. 2) Supports both 32bit and 64bit. 3) Now is full of particles, effects and super polished. 4) Now up to 5 persons can be saved. 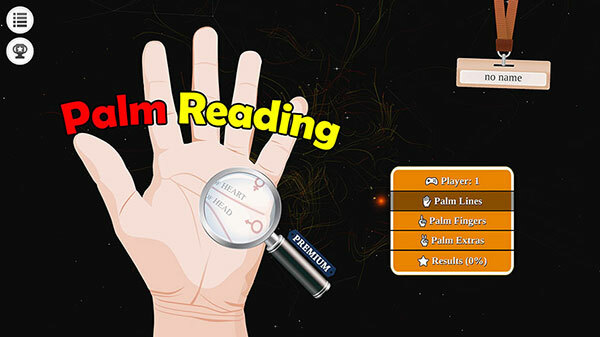 GO TO PALM READING PREMIUM FOR STEAM V2!